But when we weren’t working the land for food or in the bush for money, we were on the rivers or in the mountains. My family vacations were spent on pack trips by horse going into the Skeena Mountains or the Atnas. But of course, we couldn’t take a vacation for a mere vacation, that would have been considered a complete waste of time. We had to get enough moose, caribou, grouse and maybe a black bear to bring home for winter’s meat. Black bear makes damn good ham and bratwurst, and you can render the fat for lard. We grew up growing or wild harvesting a lot of our own food because we couldn’t afford to buy it. Even though we raised cattle, we couldn’t eat much of it because that was money out of our pockets. So we hunted wild game to fill our pantries. The line between bankruptcy and paying the bills was incredibly thin but we certainly had an incredible life.Living in the Skeena region has not been the easiest existence, especially in the winter. Communities are bonded by enduring the cold months together and it’s the time where we get out and get more social to chase away the long darkness. We dream of the warm summer sun, floats down the river, sitting with family and buddies around a picnic table and eating salmon so fresh that it curls when you cook it. I love this place. It’s my home. It was my home long before I was born – more than 100 years with six generations in the Kispiox Valley. We are known as the cowboy farmers, some might say rednecks. Actually, everyone says rednecks. My dad was known for being one helluva boxer and regularly got into fist fights. I don’t know if he ever lost a fight but then again, I don’t know that he would ever tell me if he did. He taught me how to go fist-a-cuffs and I was pretty good at it. The fact that I grew into almost a 6-footer and spent the summer tossing hay bales around for hours and hours every day might have had something to do with it. Still, I avoided conflict like the plague. I despised conflict or disharmony. They made me cringe and still do to this day. I would always try to walk away, feeling sick in my stomach, wanting to run, but growing up in the bush you know that running away only encourages chase and the best way to deal with it, or at least the most instinctual way, was to face up and deal with things because they will only get worse if you don’t.This is why I have trouble with the word environmentalist. It’s not really inclusive of people like me or my family. We aren’t fighting for the environment. We’re fighting for our homes and for our families because we need clean water and wild game. If we protect habitat for salmon and wild game, we can eat good clean food. I can’t believe I said habitat. Hell, I even catch myself talking about “ecosystems” these days. 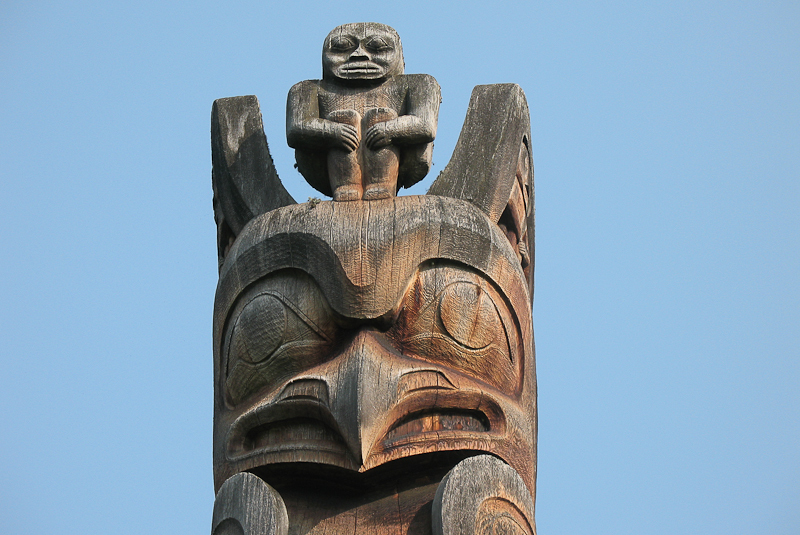 Gitxsan totem pole at Kispiox, BC. Photo by Hans-Jürgen Hübner. 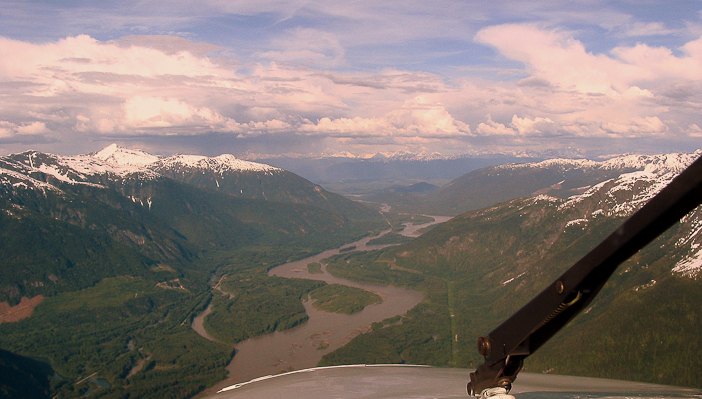 Ancient petroglyphs on the Skeena River. Photo: Jim Allen. Skeena salmon. Photo: Paul Colangelo. Shannon McPhail is a mother of two and the Executive Director of the Skeena Watershed Conservation Coalition, a non-profit group formed by friends, family and neighbors to fight proposed coalbed methane wells in the Sacred Headwaters of British Columbia where three of Canada’s greatest wild salmon and steelhead rivers, the Skeena, Stikine and Nass, are born. On December 18, 2012, after a 10-year battle, the Sacred Headwaters received permanent protection. This story was first published on Shannon’s blog, From the Woodshed. With thanks to Moldy Chum and Patagonia.